Natural birth plans have emerged as a battle cry of resistance among women who are dissatisfied with today’s medically-aggressive model of maternity care and high cesarean section rates. However, natural birth does not need to be a source of controversy or conflict between women and their nurses and doctors. Natural Labor and Birth: An Evidenced-Based Guide to the Natural Birth Plan seeks to broaden the medical community’s understanding of the motivations and needs of naturally laboring mothers, while also exploring why natural birth is often so difficult to achieve within our current system and what can be done to change that. It is a complete resource on the topic of natural childbirth, teaching healthcare providers and other birth workers the skills necessary to assist a woman through an unmedicated birth and reviewing the compilation of medical evidence in support of those methods. It demonstrates how natural birth can exist within the framework of traditional antepartum care and hospital deliveries, and offers alternative solutions to common challenges that often disrupt the physiologic birth process. 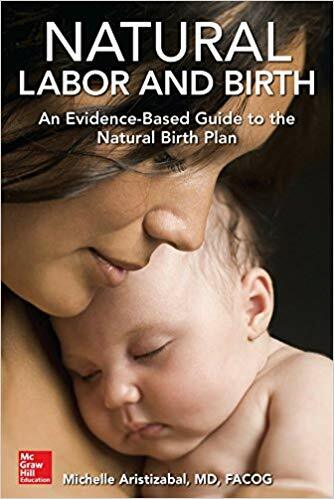 Natural Labor and Birth: An Evidenced-Based Guide to the Natural Birth Plan is also an unbiased resource for pregnant women seeking a more thorough and scientific understanding of unmedicated birth. This guide will help women and their partners make their own birth plans from a truly informed place. It will help women understand the barriers they may face when seeking a natural birth and give them the ability to better communicate their needs and preferences. By creating room for natural birth within our maternity system, this book will help readers build a community of care where all women feel respected, acknowledged, and empowered during their birth experience. ​Michelle Aristizabal, MD FACOG is a board-certified General Obstetrician and Gynecologist in Montclair, NJ. She runs a busy, private practice with a special focus on supporting women who desire low-intervention, unmedicated births. Dr. Aristizabal earned her medical degree from the University of Arizona and completed her obstetrics training at Saint Barnabas Medical Center in Livingston, NJ. As an attending physician, she has worked tirelessly to expand the acceptance of natural birth practices within her local medical community and educates medical students and resident physicians in alternative labor management techniques.